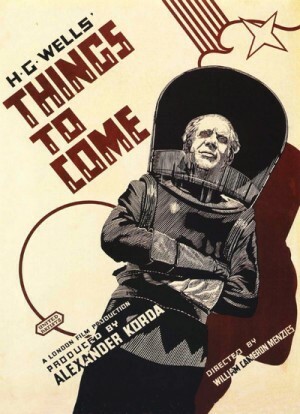 A landmark collaboration between writer H. G. Wells, producer Alexander Korda, and designer and director William Cameron Menzies, Things to Come is a science fiction film like no other, a prescient political work that predicts a century of turmoil and progress. Skipping through time, Things to Come bears witness to world war, disease, dictatorship, and, finally, utopia. Conceived, written, and overseen by Wells himself as an adaptation of his own book, The Shape of Things to Come (1933), this megabudget production, the most ambitious ever from Korda’s London Films, is a triumph of imagination and technical audacity. In this "history of the future," a second world war breaks out in 1940. War continues until 1966, by which time the social order has been destroyed altogether and a plague called the "wandering sickness" further decimates the population. A warlord referred to as "the Boss" now controls the ruins of Everytown. John Cabal, a former resident of the city, returns to depose "the Boss" and reveals the establishment of a new World State in Basra, run by an elite group of scientists and intellectuals who use superior air power to maintain order. In 2036, Everytown has been completely transformed into a technologically advanced and strictly ordered society. Oswald Cabal, John Cabal's grandson, is planning to send the first humans to the moon via a "space gun," but but not everyone is happy with it and the technological advancements made during the years of peace. • Commentary - David Kalat discusses the production history of Things to Come, H.G. Wells' novel as well as his political orientation (there is plenty of very interesting information about the writer's meeting with the Soviet authorities and the socio-political climate in Europe at the time when the film was made), the structure of the film and its prophetic messages, etc. The audio commentary was recorded exclusively for Criterion in 2013. • Christopher Frayling on the Design - in this video interview, writer and cultural historian Christopher Fraying discusses the special effects and spectacular designs used in Things to Come. The interview was conducted exclusively for Criterion in 2013. In English, not subtitled. (23 min). • Bruce Eder on the Score - in this visual essay, film historian Bruce Eder discusses composer Arthur Bliss' score for Tings to Come, as well as H.G. Wells' artistic vision for the film. The essay was produced exclusively for Criterion in 2013. In English, not subtitled. (17 min). • Laszlo Moholy-Nagy - Bauhaus artist Laszlo Moholy-Nagy contributed special effects to the production of Things to Come, but very little of his work was used in the final film. Presented here is some of the unused footage that was found in a storage at Denham Film Studios in the 1970s. Without sound. (4 min). • Things to Come, 1936-2012 - an experimental work by artist Jan Tichy, which uses some of the unused footage mentioned above to create a three-channel digital video installation piece. Without sound. (3 min). • The Wandering Sickness - audio recording taken from a single-sided 78 r.p.m. gramophone record in the collection of film historian John Huntley, who worked for Alexander Korda's London Films during the production of Things to Come in 1936. It features a reading from the shooting script of the disease's first appearance in the film. In English, not subtitled. (4 min). • Commentary - a terrific audio commentary by Things to Come expert Nick Cooper, who does an in-depth analysis of the film and discusses its production history. There is an enormous amount of factual information here which allows one to gain a much better appreciation of the film, H.G. Wells' novel, etc. • Trailer - re-release trailer for Things to Come. In English, not subtitled. (5 min). 1. Image Gallery - a collection of images courtesy of Things to Come expert Nick Cooper. The collection contains rare images from the film as well as scenes that were shot but either no longer exist or never made it to the original theatrical print. Various photographs are grouped together with short text-format descriptions. (18 min). 2. Merchandise Gallery - a second collection of images from Things to Come expert Nick Cooper's personal archive of memorabilia. The collection contains promo materials, magazine supplements, press materials, sheet music, trade adverts, posters, and a lot more. (9 min). • The Virtual Extended Edition - though the restored version of Things to Come presented on this Blu-ray disc is the longest-running print known to exist, its original theatrical run-time was significantly longer, though this version is now lost. Additionally, there were a number of scenes that were either filmed and not used or not filmed at all. This 'Virtual Extended Edition' of Things to Come is an expansion of the print on this disc in such a way as to include cue-cards at various points detailing additional dialog and scenes. This is not a Director's Cut of Things to Come, or even an attempt to reconstruct the original theatrical version - this is just a "What If" attempt to show what possibly could have been. In English, not subtitled. (134 min). • Interview - Russell Harty interviews actor Ralph Richardson. The interview was conducted in 1975. In English, not subtitled. (41 min). • On Reflection: Brian Aldiss on H.G.Wells - a wonderful documentary feature about the life and legacy of H.G.Wells from 1971. In English, not subtitled. (24 min). • The Wandering Sickness - an original 78rpm recording - this unique single-sided acetate gramophone disc, formerly in the collection of an ex-London Films employee, was used to record an extract from The Shape of Things To Come describing the symptoms of the "Wandering Sickness", followed by a reading from the shooting script of the disease's first appearance in the film. Audio only. (5 min). Links are dead for Blu-Ray Network.